Cliff diving strips ‘high diving’ to its primitive essence, taking it away from the swimming hall diving board and up onto a precarious cliff edge, and by doing so gives it a thick dose of danger and some picturesque thrills. Cliff diving is literally that, the acrobatic feat of diving off a cliff into the water. It is an extreme sport because, with an average jump height of twice that of the top 10 metre diving board, the impact into the water is dangerously high, leaving little room for error and pushing the diver’s body to the limits. It's location, in the natural coastal environment, with the bonus hazards of jagged rocks, pushes the excitement and life-enhancing rush up to an intoxicating level. 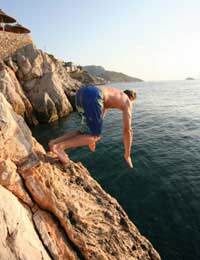 With its dare-devil and high risk nature, cliff diving is one of the most dangerous diving disciplines. Like with all extreme sports, the less prepared and skilled you are the more dangerous it will be, but even the most experienced will have to contend with a strong element of risk. During the 3 second freefall the body is subject to profound forces of up to 10 Gs, but it is the diver’s entry into the water that provides the greatest risk associated with cliff diving.The incredible force of the water upon entry will compress and contort the body unless the diver is at optimum strength and muscle tautness. The impact is typically 9 times of that from a 10 metre platform. Cliff diving therefore leaves little room for error, with a crash landing into water at 26 metres said to have a similar impact to landing on the pavement from 13 metres. For the same reason, experienced divers will only perform a limited number of dives per practise session or competition because the immense physical strain it demands will lead to a decline in performance, and could make all the difference to the success or failure of a dive. A good cliff diver should have a strong technical education and many years of experience in diving or in a similarly acrobatic sport. Nevertheless no amount of preparation will give prospective cliff divers the rare combination of courage, self-confidence and incredible physical control required for this high risk sport. They must also have the ability to make split second decisions based on the impulses of sight, space and time. Cliff diving was officially established a sport in 1996 upon the foundation of the Swiss-based World High Diving Federation (WHDF). The aim of WHDF is to organise national and international cliff diving competitions as well as promote it and provide importation regulatory and safety information. The WHDF have advised that the height of the jump should be between 23 and 28 metres for men and 18 to 23 metres for women. Dives above 28 metres are regarded in principle to be completely pointless, as the significant increase in danger is not rewarded with any increase in freefall time. The ideal entering speed should between 75 and 100 kmph and the free fall time should be around 3 seconds.